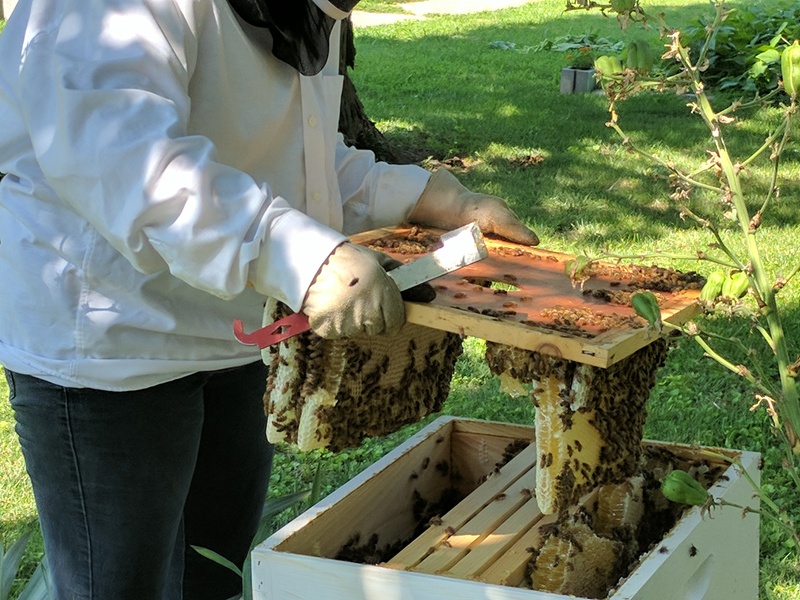 We took around 12 frames to Hannibal over the July 4th Weekend to extract some honey! 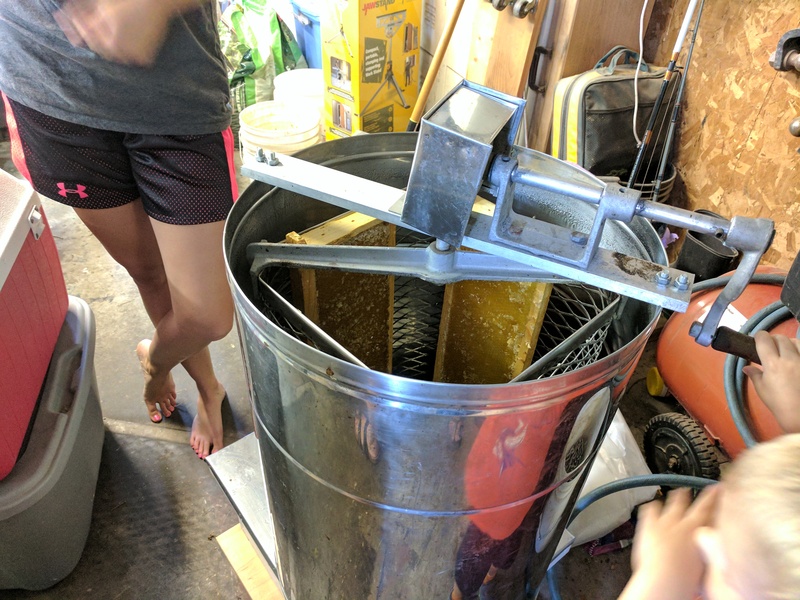 Ultimately, the process took a few hours and was mostly carried out in the garage in order to keep bees from homing in on their wares and coming to reclaim it. This was the first time we’d extracted our own stuff (though we combined ours with 6 or 8 frames of Mark’s stock), so I grabbed a few pictures of the process, as we had multiple questions across Instagram and Facebook asking how this all worked. 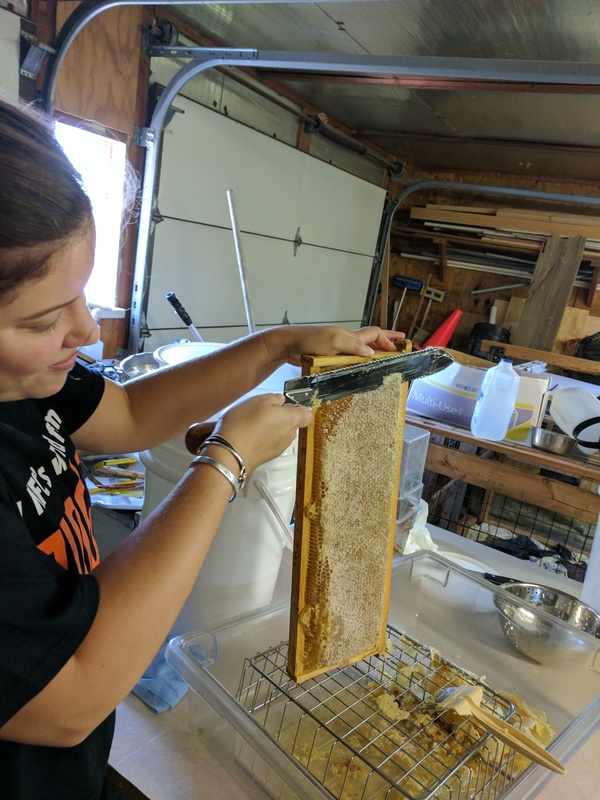 After Brooke used her sweet serrated knife up above to scrape off the wax cappings on the frames, they were put in an extractor 4-at-a-time. Basically, the extractor is a metal barrel with a hand crank that acts as a centrifuge. The honey is pulled out using centrifugal force and it drops down to the bottom of the barrel. A spigot is down there to allow for draining into another bucket after filtration, as there’s a lot of extra “stuff” in there we don’t want (i.e. wax, dead bees, etc.). After all of this was done, we ended up with around 6 gallons of honey, which was far more than we were expecting! Anyway, remember the new hive? Well, Brooke didn’t put frames in it last weekend after we got back. So, she got in there today and we found out the bees have been kinda busy! Seriously. That isn’t supposed to happen in a week. There isn’t a great solution to this, as the new comb had honey and brood in it. 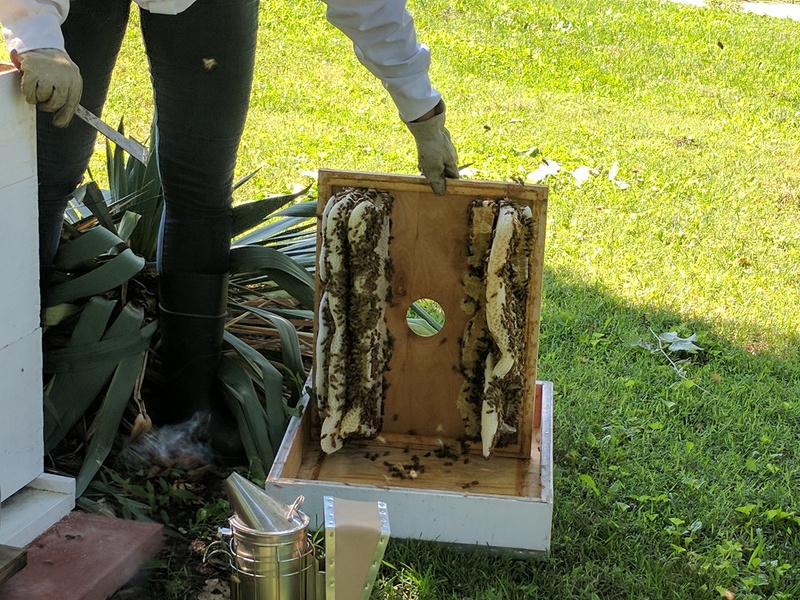 Brooke ended up shaving off the comb into the super on top, then putting a “queen excluder” above the super (to, obviously, prevent the queen from crossing the barrier), and then put a new super on top of the hive. The crazy thing is that this is the new hive that’s only about 3 months old. Apparently, they’re doing fine! 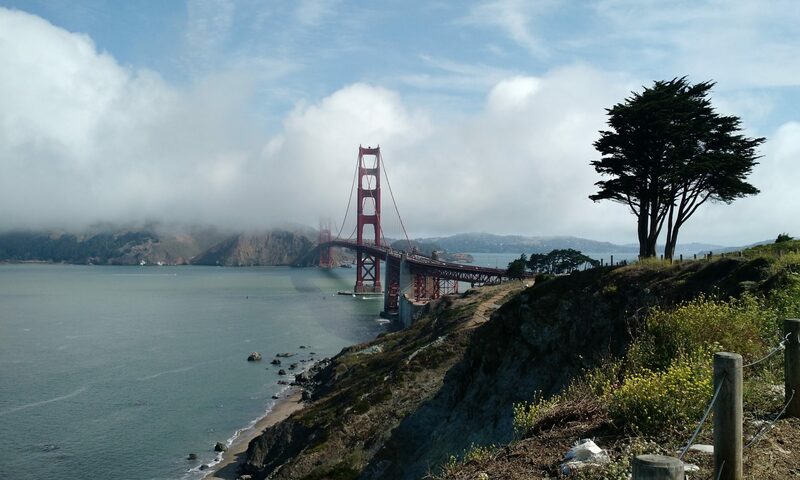 Doing some crazy stuff, but still doing fine!